For more precise performance information, please consult the datasheet. The Juice4halt 5V module is a supercapacitor-based energy storage. 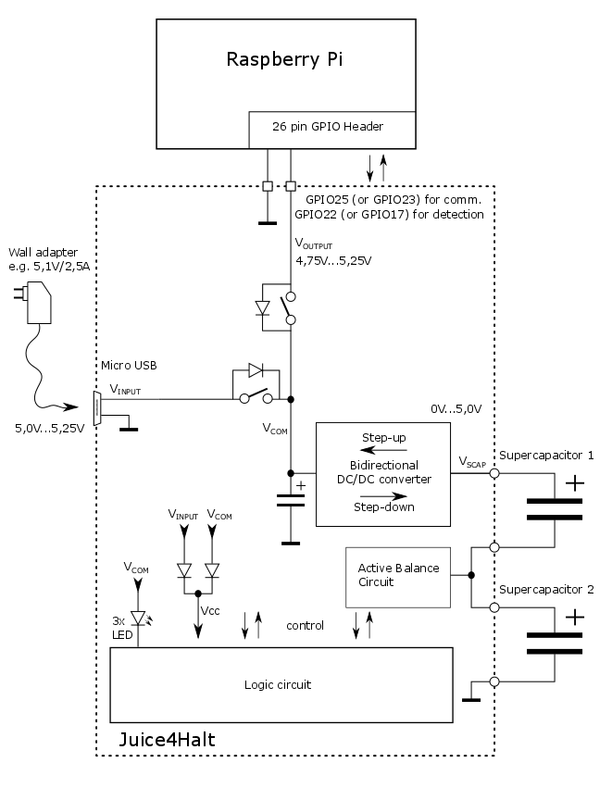 It contains a bidirectional step-up/step-down converter working as the interface between the stable 5V supply rail and the supercapacitor. During charging the converter works in step-down mode and transports energy from the external power supply to the supercapacitor. 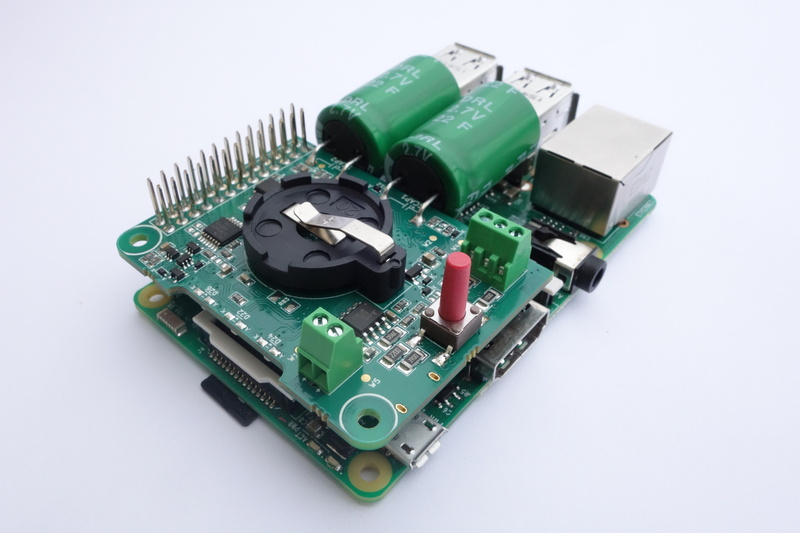 In case of a power failure, the load device (Raspberry Pi or another SBC) is supplied from the supercapacitor via DC/DC converter working in step-up mode. The Juice4halt HV module is a supercapacitor-based energy storage. It contains two independent DC/DC converters. 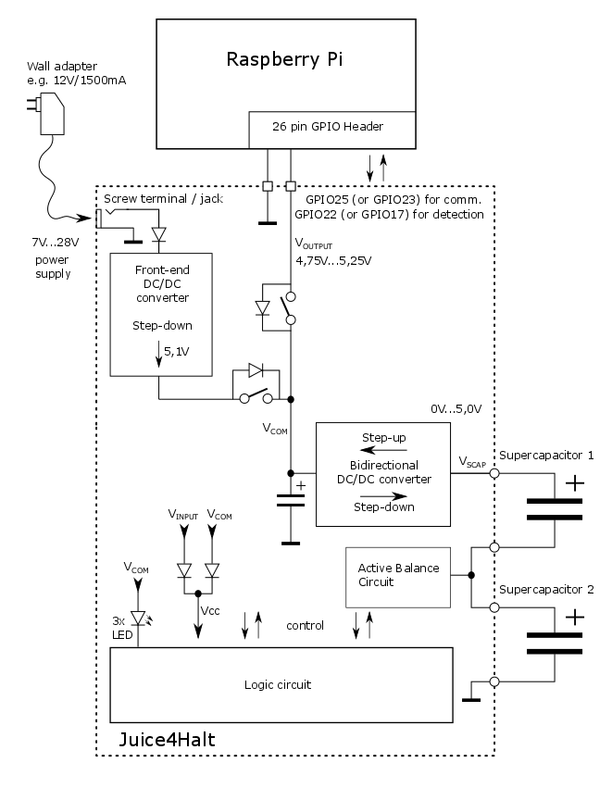 The first one is a bidirectional step-up/step-down converter working as the interface between the stable 5V supply rail and the supercapacitor. During charging the converter works in step-down mode and transports energy from the external power supply to the supercapacitor. In case of a power failure, the load device (Raspberry Pi or another SBC) is supplied from the supercapacitor via DC/DC converter working in step-up mode. 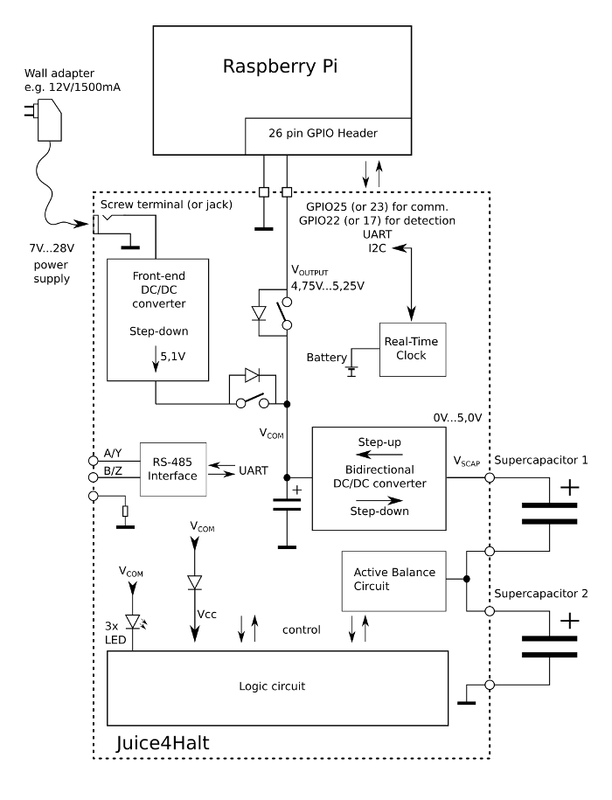 The second DC/DC converter is a Front-end step-down converter. The only function is converting a high input voltage down to 5.1V for the 5V rail. The Juice4halt RTC-485 module is a supercapacitor-based energy storage. It contains two independent DC/DC converters. The RS-485 Interface is accessed via a 3-pole screw terminal at the inner side edge of the PCB. 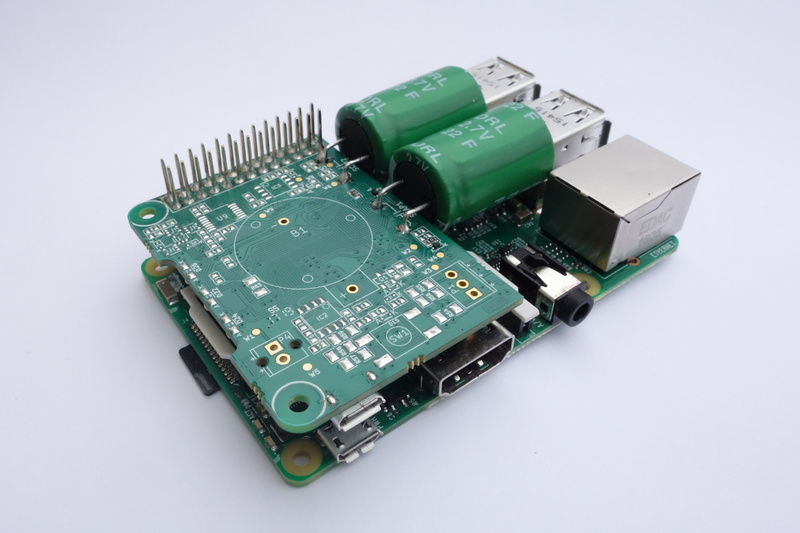 The RS-485 Interface is transformed and connected to the UART interface of the Raspberry Pi. 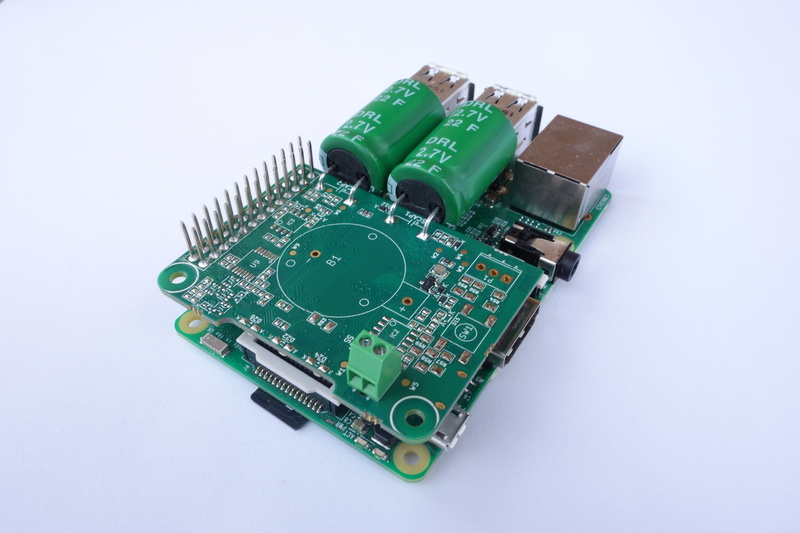 The Real-Time Clock uses a lithium coin battery for power backup when the Raspberry Pi is powered off. The battery holder is situated on the top side of the PCB. A push-button is used as a Power ON/OFF switch, and perfectly fits into the shutdown and booting scenarios, leading to a function very typical for all laptop-power-on/off buttons or for ATX power supply soft start buttons.